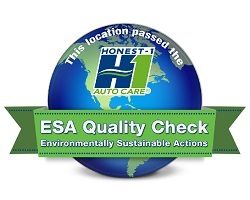 Honest-1 Auto Care proactively takes extraordinary steps to protect our environment by helping our customers maintain the most efficient and safe vehicles possible. By maintaining a vehicle in good working condition they will experience increases in fuel economy as well as reduced emissions. This can have a positive impact on our environment. More importantly we go beyond basic standards and expectations of auto care facilities and take additional measures to protect our environment now and into the future. While offering exceptional service programs for our customers to choose from, we also offer specialized, ECO-Friendly Auto Care services for those that want to play a greater part in helping the environment. An example of one of these programs is the ECO-TuneUp that includes our Comprehensive Vehicle Inspection, the use of synthetic oil, lifetime oil and air filters, platinum spark plugs, replacing spark plug wires, ECO 360 fuel treatment, and tire pressure evaluation.